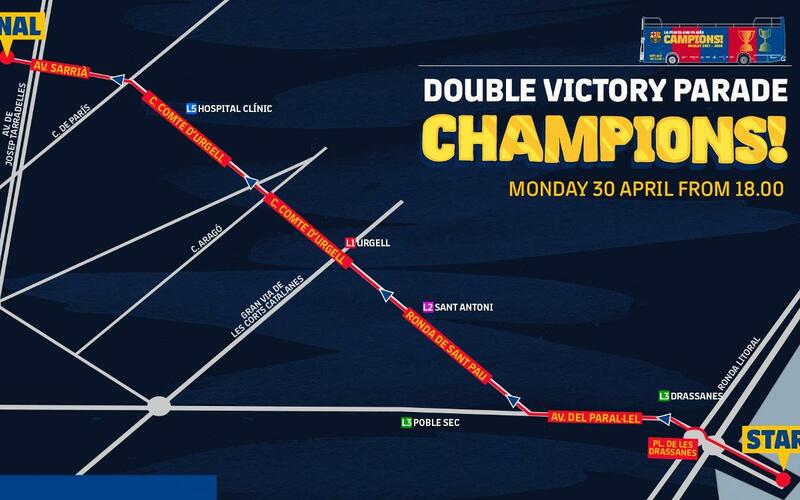 On Monday from 6.00pm CEST the open top bus victory parade on the streets of Barcelona to celebrate the league and Copa del Rey titles. The tour to mark FC Barcelona 30th Copa trophy and 25th league title will begin at the World Trade Center in the city and will last around one and a half hours, passing through Drassanes square, Paral·lel avenue, Ronda de Sant Pau, Comte d’Urgell street and Sarrià avenue before ending at the Doctor Ignasi Barraquer square. Along the route there will be three designated areas with flags, confetti, music and LED screens situated at the start of Paral·lel avenue, Comte d’Urgell street with Roma avenue and Sarrià avenue with Josep Tarradellas avenue.